Monument Chapter is one of 22 Minnesota State Society Daughters of the American Revolution chapters and one of over 3,000 National Society Daughters of the American Revolution chapters (NSDAR) in 50 states as well as 14 foreign countries. NSDAR was founded in 1890 and is the largest women's lineage society in the world with over 182,000 members. Over 935,000 women have joined DAR in its over 125 year history. 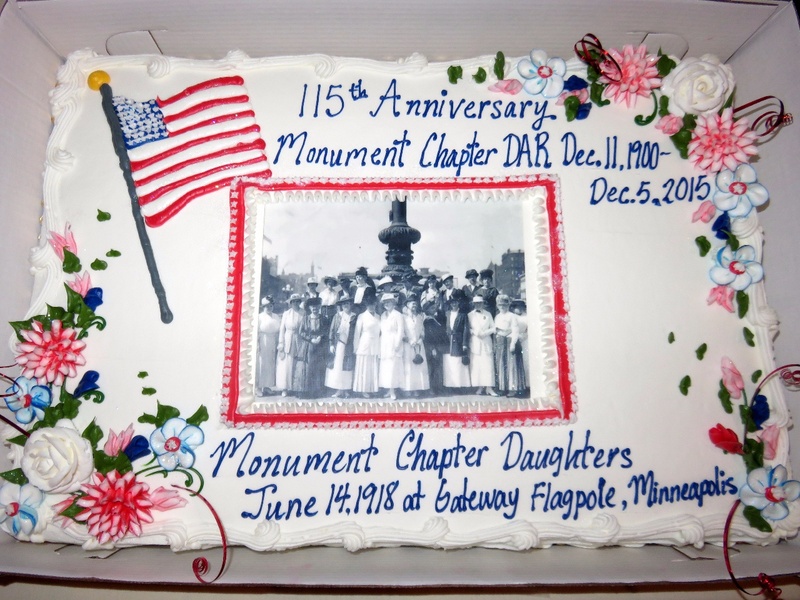 Monument Chapter is one of the oldest and, with over 100 members, the largest Daughters of the American Revolution (DAR) chapter in Minnesota. The Monument Chapter was chartered in Minneapolis, Minnesota on Dec 11, 1900. On Feb 2, 2013, the chapter charter location was moved from Minneapolis to Edina to more accurately reflect that most members live in the southwest metro including Edina, south Minneapolis, Hopkins, Eden Prairie, and Bloomington. Chapter meetings rotate throughout these cities. Website redesigned January 2015 and last updated December 19, 2018. To contact webmasters D.P. Latham and W. Washam, click Contact Us. All photographs courtesy of D.P. Latham and E. Franklin. Please do not use any photos without written permission of webmaster. Thank You.